MYTHIC: MYTHIC #3 - Now Available! 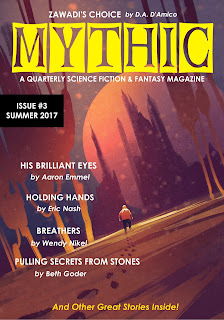 MYTHIC #3 - Now Available! We are happy to announce that the third issue of MYTHIC: A Quarterly Science Fiction & Fantasy Magazine has just hit the presses. You can buy your copy from this website today and soon the issue will be available through other retailers. If you haven't yet, please consider a subscription. Help us to continue releasing future issues of our magazine. We hope to keep sharing great science-fiction and fantasy stories with our readers for years to come.